On 1 February, 1941, German spy Josef Jakobs was apprehended by members of the Home Guard, after he shot a pistol to attract attention. Having broken his ankle during the parachute descent, Josef was searched and taken into the custody of the Ramsey Police. A farm cart transferred Josef to the Ramsey Police Station on 4 Blenheim Road. Here, Josef was searched more thoroughly and seen by the local doctor who braced his broken ankle. 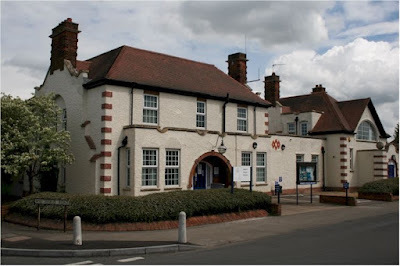 The Ramsey Police Station has changed little over the decades and looks like it would have had a very interesting history. Unfortunately, other than a few photographs, I've been able to discover nothing about this handsome building on the internet. In 2012, I visited Ramsey in the company of Winston Ramsey of After the Battle Magazine. The building is virtually unchanged, at least on the outside and is still used by the Cambridgeshire Police Force. Looking at the old and new pictures, and playing the game of "what is different", one can see that the hanging globe light has been moved so that it now hangs over the main arched entrance way. In line with that, the narrow doorway over which it used to hang has been bricked over. The diamond pattern on the upper floor has also disappeared in the modern version. Any other differences? Obviously the fence is gone too! One can only imagine that the inside of the building must look very different! If anyone has any information on the building, it would be great to learn a bit more.